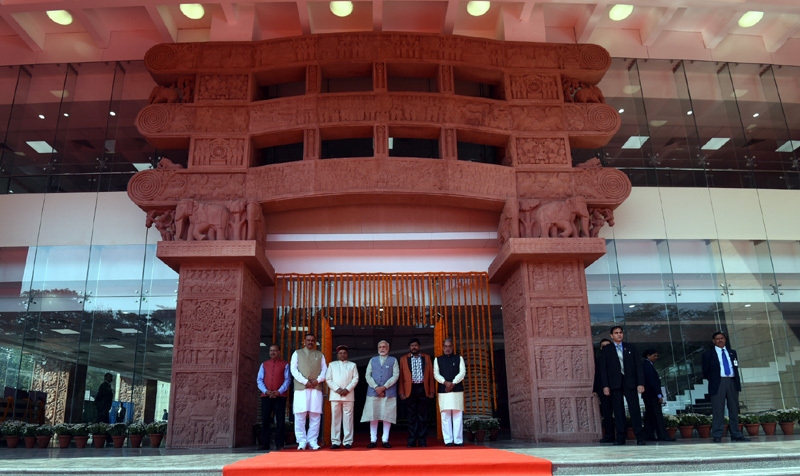 The Prime Minister, Shri Narendra Modi at the ceremony to dedicate Dr. Ambedkar International Centre to the Nation, at 15 Janpath, in New Delhi on December 07, 2017. The Union Minister for Social Justice and Empowerment, Shri Thaawar Chand Gehlot, the Ministers of State for Social Justice & Empowerment, Shri Vijay Sampla & Shri Krishan Pal and the Minister of State for Parliamentary Affairs and Statistics & Programme Implementation, Shri Vijay Goel are also seen. New Delhi: Prime Minister, Shri Narendra Modi, today dedicated the Dr. Ambedkar International Centre, in New Delhi, to the nation. He had laid the foundation stone of this Institute in April 2015. Speaking on the occasion, the Prime Minister expressed confidence that the Centre would play a key role in the dissemination of Dr. Ambedkar’s teachings and vision. Noting that the Dr. Ambedkar International Centre for Socio Economic Transformation is also part of this project, the Prime Minister said that this will be an important centre for research on social and economic issues. He said the centre would function as a think-tank for inclusive growth, and related socio-economic matters. The Prime Minister said that thought-leaders and visionaries have shaped the direction of our country, at different points in time. He said the country is indebted to Baba Saheb, for his contributions to nation-building. He said the Union Government wants more and more people, and especially the youth, to learn about his vision and ideas. That is why, he added, that important places related to Dr. Ambedkar’s life have been developed as centres of pilgrimage. In this context, he mentioned the sites at Alipur in Delhi; Mhow in Madhya Pradesh; Indu Mill in Mumbai; Deeksha Bhumi in Nagpur; and the house in London. He said that this ‘Panchteerth’ is the today’s generation’s way of paying homage to Dr. Ambedkar. He said that the BHIM App for digital transactions, is the Union Government’s homage to the economic vision of Dr. Ambedkar. Quoting from Dr. Ambedkar’s address to the Constituent Assembly in December 1946, the Prime Minister said despite his struggles, Dr. Ambedkar had an inspirational vision for the nation to overcome its problems. He said that we have still not been able to fulfil the vision of Dr. Ambedkar. He said today’s generation has the capability and the potential to eradicate social evils. The Prime Minister recalled Dr. Ambedkar’s words, that we should make our political democracy, a social democracy as well. He said that over the last three to three and a half years, the Union Government has worked towards fulfilling this vision of social democracy. In this context, he mentioned initiatives taken by the Government such as Jan Dhan Yojana, Ujjwala Yojana, Swachh Bharat Mission, insurance schemes, Pradhan Mantri Awas Yojana, and the recently launched Saubhagya Yojana. He said the Union Government is making every effort to complete schemes and projects within their intended duration, and the Dr. Ambedkar International Centre represents one illustration of this. He spoke at length about other schemes including distribution of soil health cards, Mission Indradhanush and progress towards rural electrification targets, to show the speed and commitment of the Union Government in implementing public welfare initiatives. The Prime Minister also mentioned the Stand-Up India scheme for generating self employment. 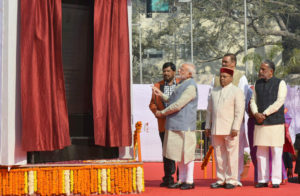 The Prime Minister, Shri Narendra Modi unveiling the plaque to dedicate Dr. Ambedkar International Centre to the Nation, at 15 Janpath, in New Delhi on December 07, 2017. The Prime Minister asserted that his call of “New India”, is the India which Dr. Ambedkar envisioned, where everyone has equal opportunity and rights, free from caste oppression, and progressing through the strength of technology. He exhorted everyone to work towards fulfilling the vision of Babasaheb Ambedkar; and hoped that we would be able to accomplish it by 2022.